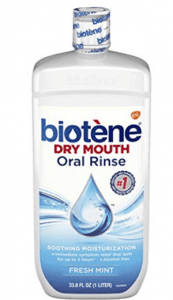 Does Biotene Dry Mouth Oral Rinse Really Work? There are a lot of different products that can be bought for oral mouth care. One that may not be as well recognized is products that help with dry mouth. This is not something that everyone has a problem with. But for those that do it can be irritating and uncomfortable. One of the products being promoted to help with this is Biotene Dry Mouth Oral Rinse. Biotene Dry Mouth Oral Rinse is a mouth wash that is used specially for dealing with the symptoms of dry mouth. It contains no alcohol and has a fresh mint taste to it. The promoters of Biotene Dry Mouth Oral Rinse are claiming that the positive effects of this product will last up to four hours. They are saying that it soothes the irritation that can come with this condition and helps to moisturize the mouth. The company is claim that it is the number one dentist recommended product for dry mouth symptoms. The hype for Biotene Dry Mouth Oral Rinse is that you don’t have to keep sucking on candies or trying to chew gum to get some type of relief. Four hours is a good amount of time to enjoy the relief that it brings. The cost of Biotene Dry Mouth Oral Rinse is $9.28 for a 33.8 ounce bottle. The commitment for Biotene Dry Mouth Oral Rinse is to use it when you get up in the morning or when the need for it arises. It may mean that you will need to carry it with you, but it is worth it if it is going to bring you the dry mouth relief that you want and need. The first thing that should be determined before even using Biotene Dry Mouth Oral Rinse is to try and find out what is causing this. There is a medical name for it which is xerostomia. Having a dry mouth is not good for the health as saliva serves some important purposes like helping to digest food. Some of the causes of dry mouth are medications,some forms of cancer treatments, dehydration and even when the weather is extremely warm. Stress and nervousness can also cause the dry mouth symptoms. Some of these causes can be eliminated while others can’t. When they can’t then relief from the symptoms is needed which is the time to rely on Biotene Dry Mouth Oral Rinse. We are prepared to give Biotene Dry Mouth Oral Rinse a thumbs up because there is a real need for this type of product. Some of the symptoms are really unpleasant such as bad breath and the tongue can become dry and irritated. It can be difficult to swallow and even hard to speak if the symptoms are severe enough. All of the symptoms are irritating and having something like Biotene Dry Mouth Oral Rinse is important for some quick and effective relief. There are several other types of oral health care products that are worth looking into, especially if you want to deal with a specific problem. What do you think? Does Biotene Dry Mouth Oral Rinse work or not? Does the Ultrasonic Colour Changing Humidifier Really Work? After going thru Chemo and radiation it was advised that I use this several a day. I went thru 4-5 bottles of this each month for over a year and it really helped. I tried other oral rinses and none gave me comfort as did Biotene!